GRAN BAHIA PRINCIPE PUNTA CANA/BAVARO is located in the East Coast of the Dominican Republic, at 20 km from the Punta Cana Airport (30 minutes by car) and 70 km of the La Romana Airport (90 minutes by car), and is 60 minutes from the Higüey Town, in the Province of Altagracia. 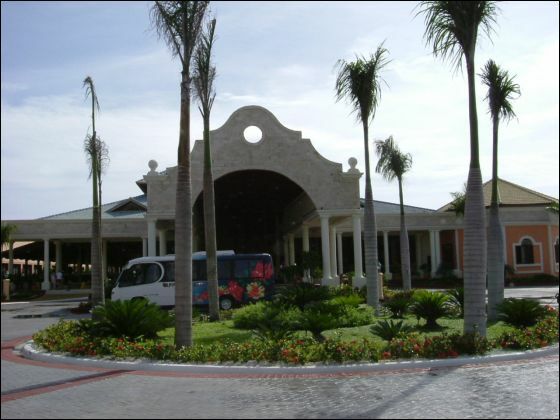 GRAN BAHIA PRINCIPE PUNTA CANA/BAVARO is situated on a white sand beach, of about 500 meters. It extends in ½ million of m2. It has numerous tropical gardens that serve as a frame to small streets in which our guests can take a stroll and at the same time feel the ocean breeze and the coolness of the natural surroundings. “All Inclusive” package includes all the meals, snacks, local drinks, house wine and cocktails in all the restaurants and bars of the hotel complex, as well as a mini-bar service with water, refreshments and beer. We also offer a towel service, loungers and sunshades in the swimming pool area and the beach, special entertainment programs for adults and children (Day and night) and an ample variety of activities and organized games for your enjoyment. 708 Junior Suites with bathtub and Jacuzzi, distributed in villas of 2 to 3 storey high. 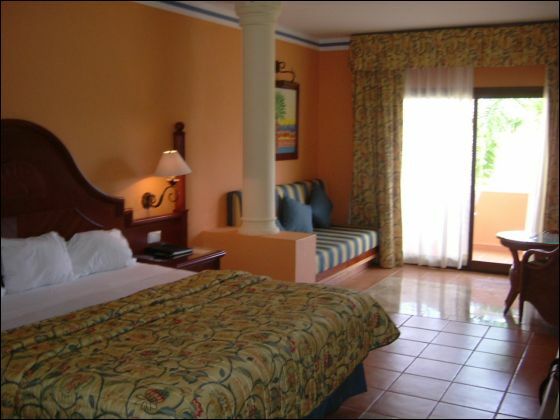 12 rooms equipped with handicap facilities. All rooms are equipped with: 2 beds full size (1,36m x 2m) or 1 King Size bed (2m x 2m) with mattresses “Pillow Top”, sofa bed, air conditioning, ceiling fan, full bath, hair dryer, satellite television, direct telephone line, security box (extra charge), mini-bar and terrace. Available access to high speed Internet in your room. Enjoy our facilities: two great swimming pools lake style with a children’s section. Broad solariums and gardens with sunshades and loungers. Service of towels in swimming pools and beach. Mini-Club for children. Amphitheater for all the entertainment shows. Tennis courts, Mini golf, center of aquatic activities and diving. Spa. Fitness center. Conference rooms with a capacity for up to 300 people. A la carte Restaurant of Mexican Specialties. All restaurants have air conditioned and are non-smoking. 3 A la Carte dinners per week of stay to choose amongst the 7 restaurants of Specialties. House wine (except at the Snack Bar of the Hotel and “Pueblo Principe”). Snack Bar: drinks, snacks and fast food until midnight and afterward the 24 hrs. service continues at the Snack Bar of PUEBLO PRÍNCIPE (only soft drinks will be served). There’s a selection of international, local/domestic beer and unlimited soft drinks at the bars of the Hotel till 23:00 hrs. All local/domestic drinks at several bars of Pueblo Principe (to be advised by the Hotel). You will be able to practice aquatic sports motor and non motorized (motor with extra charge): windsurf, catamaran, Boat Banana, etc. You’ll have the opportunity to learn diving, to play tennis, soccer or volleyball, to take classes for muscle toning, aerobics and meringue dance. And play golf. And if that’s not enough, you can always enjoy our day and night programs of entertainment for children and adults. 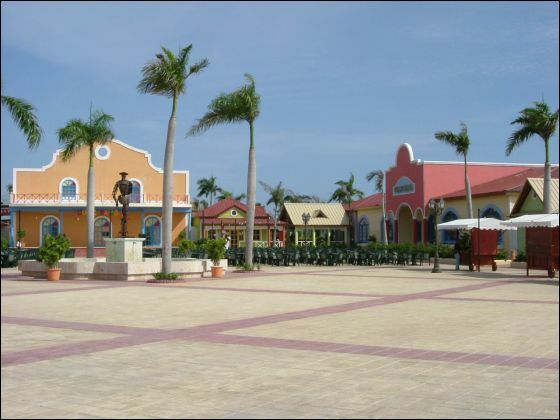 PUEBLO PRINCIPE is a leisure commercial center Dominican style where, to the compass of the rhythm of a merengue dance and other tropical sounds, the tourist will be able to enjoy the warm Caribbean nights, live music and excellent programs of entertainment. In this area you will find a variety of services and a series of stores that will make your vacation time a more enjoyable one. Sports and special activities for children in our Mini-Club. I loved it there. I would definitely recommend this resort to people. Had lots to do and everything was WONDERFUL. Flights were good, and so where the transfers. Beach was clean and good. I have used Discount Charter/Happy Landing in the past & I will continue to use the Frank and Marcy and Karin again. If I forgot to mention anything please just put wonderful! Thanks again for making our vacation fun and exciting! Sorry it took me so long to email you on how our vacation was... busy week. Well we had a WONDERFUL time in Punta Cana and the Bahia Principe Bavaro was a fantastic resort! The place was beautiful with an open aired lobby area making you really feel like you were in the tropics. The entire resort was impeccably clean and people were constantly on top of it, we even saw some people cleaning the pool deck area in the dark late at night...impressive! The grounds were gorgeous with all of the foliage and palm trees. All of the people working there were very nice and accommodating. The shuttle buses were very convenient (which we only used a few times due to choosing to walk) but they were there for anyone who wanted to use them continually throughout the day. The weather all week was sunny and warm with a few days of strong winds but nothing to complain about. It is a very large complex (and was totally full per the resort) but we never felt cramped or crowded since it is so large, multiple pools, multiple eating areas and so spread out! FLIGHTS - we had an issue on our flight out and got delayed ~1 hour and had a VERY turbulent ride for at least 1/2 of the flight (they did fore worn us before we took off that it would be turbulent but they didn't expect it to last that long). On the way back...smooth sailing. TRANSFERS - great, Apple representatives were clearly waiting for us and got us to our resorts...no problem. All of the Apple representatives throughout the trip were very friendly and accommodating! BEACH - ABSOLUTELY GORGEOUS! One of the nicest beaches we've been to. POOL - Gorgeous and extremely clean, clear water! FOOD: Overall good. Some "a la carte" restaurants seemed to be more for presentation/show than quality/quantity (ie: Le Gourmet and Spanish restaurant). The Japanese restaurant was outstanding and so was the Garden Grill. The BBQ on the beach seems to be a "hidden" (not many people knew about it, we were told by another passenger on the plane) restaurant which was also very good. It is not considered an "a la carte" restaurant but you do need reservations. One thing that we didn't realize was that in the "a la carte" restaurants men needed to wear long pants and collared shirts (which was noted in our documents and on your site, but we missed this). We had an issue at Le Gourmet.... they wouldn't let us eat there no matter what without my husband wearing long pants meanwhile other men wore t-shirts, torn jeans and flip flops!! My husband had on a very nice shirt, nice shorts, nice shoes but no go! We asked for the manager who was polite but wouldn't budge. He did offer to get us into another restaurant right away without a reservation otherwise back to the buffet! He actually called a small car to pick us up and he escorted us to another restaurant then seated us immediately! The buffets were good but honestly we were tired of buffets by the end of the trip. I guess we didn't realize how much of the week was buffet food vs. "a la carte". ROOMS - very nice and clean. We had a few issues with our particular housekeeper. She failed to bring us clean towels more than once and a few times didn't remove the used ones. We called and they took care of it. It wasn't a big deal just a little annoying when you were trying to shower and get ready for dinner with no towels and we had to wait (one time for hours). Other people didn't seem to have the same problem. Also in the rooms there were "mini-bars" which I guess we have a different interpretation on what a "mini-bar" should be. Ours had a large water with 2 beers and a few bottles of pop. In our past "all-inclusive" trips the "mini-bar" was full with a variety of liquors, soft drinks, water and beer which was restocked as needed daily. They forgot to check ours and restock a few times. ENTERTAINMENT - Great! The outside shopping and theatre were very nice and entertaining. I think every night the theatre was packed. We didn't ever watch an entire show but saw many of them for a little while and they were great! EXCURSIONS - We did the Marinarium (swim with sharks/stingrays/snorkel etc.) it was GREAT! We also did the zip lines....AWESOME!!!!!!! The people running both of these were AWESOME!!!! Thank you all for your patience and help with this wonderful trip!!!! Frank you were so right on which beach would be the better of the two! The trip was AWESOME! Honestly, it could not have been much better. We were upgraded upon arrival to the new Esmeralda section (THANKS FOR GETTING THIS UPGRADE FOR US!!!). I do not know the cost difference, but it was beautiful. The rooms were large and clean, the bathroom was spectacular with a jacuzzi tub. Reasonably close to the beach, great pool, pool bar, buffet just for the section, private classy bar, big lobby, free internet access, excellent staff, upgraded ala cart restaurants. Have I gushed enough? You were right on the overall size of the Bahia-HUGE. But for me it was perfect. I only took the tram once. It was a great place to run. Plenty of umbrellas until late in the morning. Being a sunrise person, I always had a choice. We plan to go back to either the Bahia or Iberostar for 2 weeks next time. Pool: Looked pretty-I only went in once-just to say I did it. I am a beach person. The Esmarelda did have an adults only jacuzzi pool that was remarkable. Service: Terrific Anything I asked for was taken care of immediately. Not that I asked for much. I heard some people complaining and read a review on line. As always, seems like if you try hard you can find something to complain about. When we were making our ala carte reservations, there was a mix up-I told the person, not to worry, we were on vacation and easy to get along with. He gave us an additional dinner that week. Food: It was good- Nothing compares to 'cruise food" so we got what we expected. The 'dominican rest" was not very good. The others were wonderful very good. Entertainment: We did not enjoy it but the theater was always crowded so it must have been okay. We preferred the bar at Esmeralda. We are back home :( unfortunately! 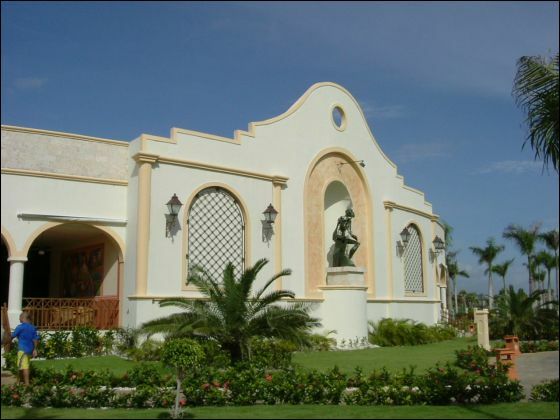 We loved our stay at the Bahia --- the resort is stunning, the staff amazing and pleasant, the food fantastic and filling! *we gained a few pounds and amazing tans* ... what else can we say???? We were truly amazed and beyond satisfied. Thanks for helping in planning a birthday surprise for me. The resort set up a beautiful dinner at the Grille Steak restaurant for us, where they had us sit in the middle of the room ... the staff with the maître brought out Greg's surprise: a HUGE bouquet of 34 red roses arranged with some local exotic flowers. Everyone was amazed because from what I heard roses were extremely hard to get in Punta Cana (everyone stared at the flowers because they have never seen so many roses in one bouquet!). They treated us like royalty, waiting on us hand and foot the entire night. The staff sang Happy Birthday as they carried in a special cake for me, written in English. The meal and celebration ended with a bottle of champagne courtesy of the restaurant manager!! I was practically in tears. The entire set up was heart warming - what a great man I have and what great people at the Bahia! The room they set us up in was at the top floor close to the pool -- near the beach as we wanted. It was perfect! Honestly, Marcy this vacation was better than the previous one last year. If you can swing this resort for us next year for a similar price -- let us know! Marcy, thanks again for all your help and for setting this up for us ...you are an amazing person yourself for making this vacation this easy! I wanted to email sooner, but it has been non stop since we have been home. In general the Bahia was beautiful. The staff was THE BEST! Everyone is so helpful and nice. The grounds are very nice. The rooms are a nice size. It was great for our family! The wait staff again was so attentive. The restaurants were clean and presented the food so nicely. Talk to you soon and please let me know of any super deals! We'd love to return! ps..My mother in law did GREAT! She only needed her oxygen once. And the hotel handled all of that just wonderfully. The doctor on staff was very nice and called my mother in law daily to see how she was. First we want to thank you for helping us book our honeymoon and assisting us with all the details that it takes to put together a trip like we had. Everything you said was 100% correct and we can’t thank you enough. We will definitely be calling you again the next time we decide to book a vacation. Pools – Couldn’t have been better… We spent the majority of our time at the pools since we loved it so much. The pools were busy yet not crowded, the pool bar was a great addition and they had waiters and waitresses constantly circling the pool taking drink orders. The pool was very clean and had many activities. Food – Food was alright but the reason we went to Punta Cana was not for the food. The food itself was plentiful. The only complaint I would have is the some of the other guests were very rude around the buffets. But the service and help at the restaurants was great. Beach – Very beautiful! The beach was great and I have never seen such crystal clear / blue water. Most of the guests at the resort went to the beach but the beach offered a very nice snack bar and a very large pool for people. The resort was a nice 20 minute walk down the beach from some shops so it made for a very nice walk. The beach was very clean and well maintained. Again, than you for everything we had a great time.